Mental note to self..get a move on. *Finish raised beds inside greenhouse. *Install new weather proof sockets in greenhouse and poly tunnel. 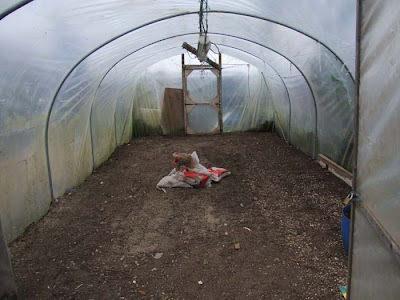 *Set up grow light and refix strip lights in tunnels. 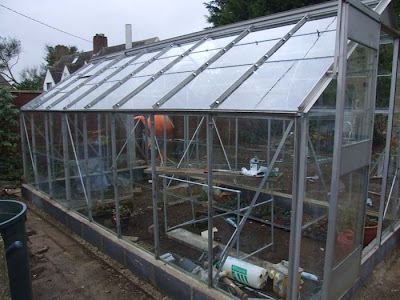 *Order new autovent for greenhouse as one doesn't seem to be working. *Put in foundations for blocks to go into large polytunnel, if I ever get the blocks. *Order compost/manure/soil in 1 ton bags to fill raised beds. *Move and sort bonfire on allotment so entire neighborhood don't dump there crap on it anymore. Full of metal and glass, ash will come in handy on the onion bed. *Put up sign telling them all to p*ss off. *Fix fence that my dad hit with tractor. *Sort out lifting arms on the tractor as back up lifts to much, resulting in cracked back end and a massive dent in my wallet. *Kill all the chickens, they don't lay lol. *Get a new pig(s) taste great. *Order all seeds and leeks. I'm sure there is lots more, but that will keep me going for a while. 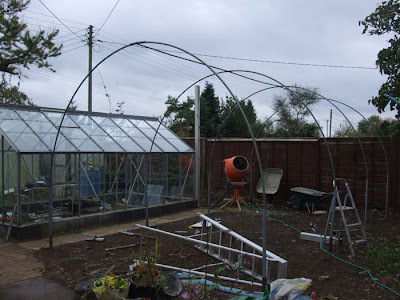 Over the weekend the old polytunnel that I took down has now been put back up next to my greenhouse. I have got the frame in place but still requires a lot of work to be done. I need to get hold of a load of timber battens (treated) and fix them so I can make a framework up for the side vents. Here you can see the modified straight sides that I have made. Its basically a 4ft scaffold bar rammed into the ground with concrete. I have then slipped in a 8ft strong aluminum bar with approximately 3.6ft above ground level, from which then the polytunnel frame sits 3ft inside this tube all bolted together. The joke is "are you growing palm trees" every time someone comes round, or the zoo rang and asked if you had room to house two giraffes. surprisingly this will only cost me £98 to cover from "firsttunnels.co.uk" with the most expensive being the timber and enviromesh for the vents. Here's the largest on my tunnels which I have cleaned out. I will be growing my leeks and onions in this next year. Again I hope to put side vents in this for as little money as I can. I also need around 400 blocks to make the raised beds either side, or I may have to go the cheap route this year with wood. One of the beds for my onions will also have a heating cable installed so I can warm the ground when I come to planting, seep hoses also need to be put in place..nearly forgot the soil/compost/manure needs to be ordered aswell to fill them up. I cleaned this tunnel after I took this picture with armillatox, anyone using this stuff inside a tunnel please use protective clothing, goggles, gloves, mask, It really does stink and wont come off for a few days, your lungs will hurt, your eyes will be sore and your ears will burn, even with a mask my throat was sore. 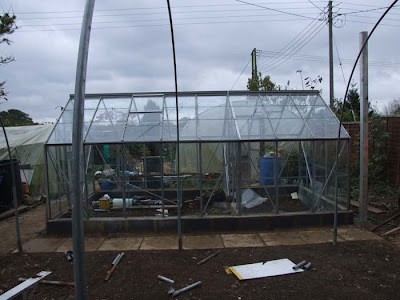 Well here she is, my greenhouse that I traveled miles to get, dismantle, fix and rebuild, well worth it. We put this up extremely solid and we spent at least two weeks making a proper base and cutting the greenhouse in once it was up. 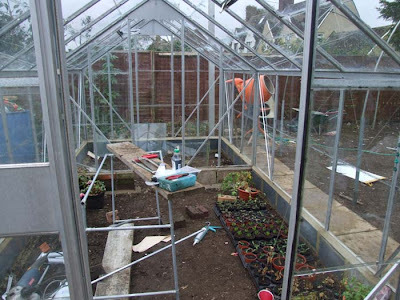 Putting the actual greenhouse up took only 4 hours including glass and clips, the prep and work after took some weeks. Yes I'm not a believer in cleaning up as you go and the garden is looking like a construction site. 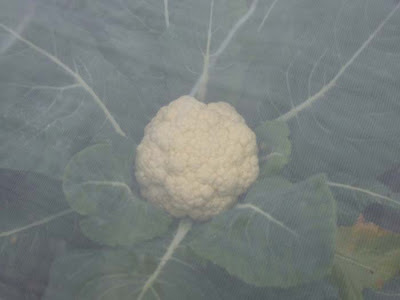 Still have cauliflowers growing under the enviromesh outside, note I have not covered the heart as they are just for eating. Well I have made a start to my mammoth task's ahead of me. Managed to get the old polytunnel down, clear the ground and lay the foundations for the greenhouse, along with the breeze blocks to sit the actual greenhouse on. I have just about finished putting the 16.5 x 8.5 greenhouse up at the weekend despite the rain, nothing can wait as I'm running out of time. I have a few paths to lay now which will have to wait until it dries up I'm afraid. 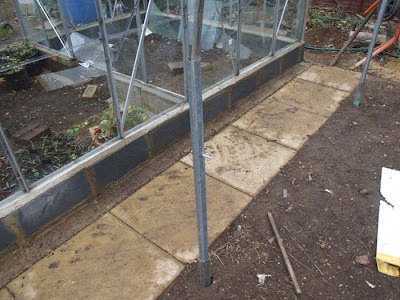 So while it is raining I will make a start on rebuilding the old tunnel with high sides for my stump carrots and parsnips for next year. I still have 7 ton of sand to shift outside from my main large tunnel which next year will be used for my leeks and onions. I am hoping I can move the sand this week so I can make a start at building the raised beds ready for the mix to go in. I also want side vents in this tunnel but to be honest that can wait until May if not later. My onion bed will have heating cables underneath so I can warm the soil and plant my onions a lot earlier. Air temperature is not a big concern for onions when strong healthy plants, and I only cover them if we have hard frost for a few nights. I should in theory be able to plant out March/April with the leeks being planted out around May. My 3rd tunnel will again be used for cucumbers unless I decide not to bother with them as they do take an entire tunnel up. I may well just grow more tomatoes as they are more productive and are used up quicker, unlike the 40 cucumbers I threw away just last week. 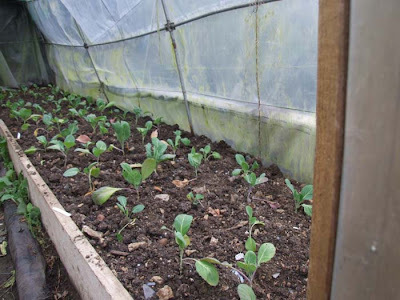 My greenhouse will be used mainly to grow on my onions, leeks, cuttings, seeds etc over winter with a heater and after that planted up with tomatoes. Need to get the tractor out this week and sort the allotment out aswell, and work the 24 ton of manure in. I have so much to do I will be amazed if I get it all done before winter is here.